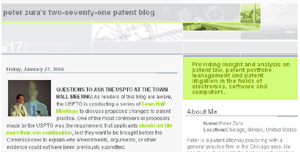 Patent blogs are a great source of current and useful information on all aspects of patents. Here are some of the best. Particularly good for keeping current with patent law cases. Something new almost every day--short and pithy blog entries. Detailed analysis of current patent law and litigation activities. A personal favorite--great content and great design! 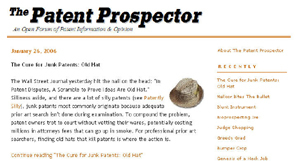 Question and answer format blog on such topics as "What’s a patent troll and why does everybody hate them?" Find more patent blogs and other current information about patents using Google. Use quotes to make your searches more specifics.